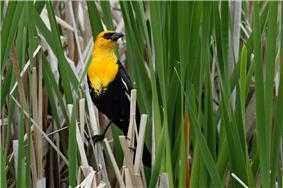 Many kinds of birds nest in marshes; this one is a yellow-headed blackbird. Marshes provide habitat for many types of plants and animals that have adapted to living in flooded conditions. The plants must be able to survive in wet mud with low oxygen levels. Many of these plants therefore have aerenchyma, channels within the stem that allow air to move from the leaves into the rooting zone. Marsh plants also tend to have rhizomes for underground storage and reproduction. Familiar examples include cattails, sedges, papyrus and sawgrass. Aquatic animals, from fish to salamanders, are generally able to live with a low amount of oxygen in the water. Some can obtain oxygen from the air instead, while others can live indefinitely in conditions of low oxygen. Marshes provide habitats for many kinds of invertebrates, fish, amphibians, waterfowl and aquatic mammals. Marshes have extremely high levels of biological production, some of the highest in the world, and therefore are important in supporting fisheries. Marshes also improve water quality by acting as a sink to filter pollutants and sediment from the water that flows through them. Marshes (and other wetlands) are able to absorb water during periods of heavy rainfall and slowly release it into waterways and therefore reduce the magnitude of flooding. The pH in marshes tends to be neutral to alkaline, as opposed to bogs, where peat accumulates under more acid conditions. 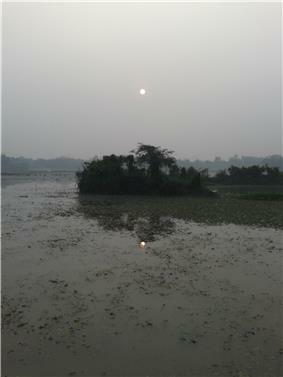 Marshes differ depending mainly on their location and salinity. Both of these factors greatly influence the range and scope of animal and plant life that can survive and reproduce in these environments. The three main types of marsh are salt marshes, freshwater tidal marshes, and freshwater marshes. These three can be found worldwide and each contains a different set of organisms. Saltwater marshes are found around the world in mid to high latitudes, wherever there are sections of protected coastline. They are located close enough to the shoreline that the motion of the tides affects them, and, sporadically, they are covered with water. They flourish where the rate of sediment buildup is greater than the rate at which the land level is sinking. Salt marshes are dominated by specially adapted rooted vegetation, primarily salt-tolerant grasses. Salt marshes are most commonly found in lagoons, estuaries, and on the sheltered side of shingle or sandspit. The currents there carry the fine particles around to the quiet side of the spit and sediment begins to build up. These locations allow the marshes to absorb the excess nutrients from the water running through them before they reach the oceans and estuaries. These marshes are slowly declining. Coastal development and urban sprawl has caused significant loss of these essential habitats. 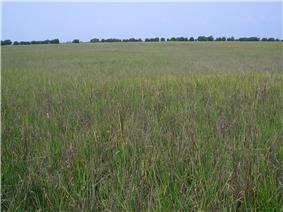 Although considered a freshwater marsh, this form of marsh is affected by the ocean tides. However, without the stresses of salinity at work in its saltwater counterpart, the diversity of the plants and animals that live in and use freshwater tidal marshes is much higher than in salt marshes. The most serious threats to this form of marsh are the increasing size and pollution of the cities surrounding them. Wet meadows occur in areas such as shallow lake basins, low-lying depressions, and the land between shallow marshes and upland areas. They also occur on the edges of large lakes and rivers. Wet meadows often have very high plant diversity and high densities of buried seeds. They are regularly flooded but are often dry in the summer. Vernal pools are a type of marsh found only seasonally in shallow depressions in the land. They can be covered in shallow water, but in the summer and fall, they can be completely dry. In western North America, vernal pools tend to form in open grasslands, whereas in the east they often occur in forested landscapes. 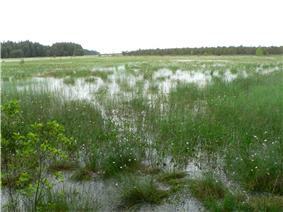 Further south, vernal pools form in pine savannas and flatwoods. 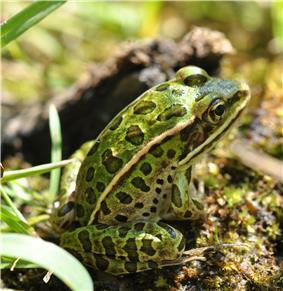 Many amphibian species depend upon vernal pools for spring breeding; these ponds provide habitat free from fish which eat the eggs and young of amphibians. An example is the endangered gopher frog (Rana sevosa). Similar temporary ponds occur in other world ecosystems, where they may have local names. However, the term vernal pool can be applied to all such temporary pool ecosystems. Playa lakes are a form of shallow freshwater marsh that occurs in the southern high plains of the United States. Like vernal pools, they are only present at certain times of the year and generally have a circular shape. As the playa dries during the summer, conspicuous plant zonation develops along the shoreline. 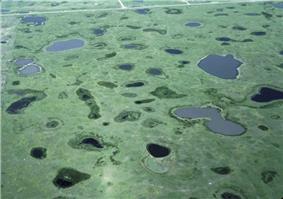 Prairie potholes are found in the northern parts of North America. These landscapes were once covered by glaciers, and as a result shallow depressions were formed in great numbers. These depressions fill with water in the spring. They provide important breeding habitats for many species of waterfowl. Some pools only occur seasonally while others retain enough water to be present all year. Many kinds of marsh occur along the fringes of large rivers. The different types are produced by factors such as water level, nutrients, ice scour, and waves. Some areas of the world have already lost 90% of their wetlands, including marshes. They have been drained to create agricultural land or filled to accommodate urban sprawl. Restoration is the process of returning marshes to the landscape to replace those lost in the past. 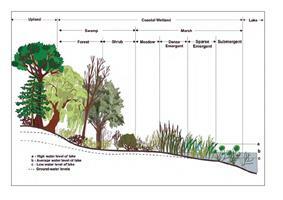 Restoration can be done on a large scale, such as by allowing rivers to flood naturally in the spring, or on a small scale by returning wetlands to urban landscapes. Many species of frogs live in marshes, while others visit them each year to lay eggs. 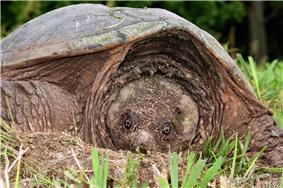 Snapping turtles live in marshes, but females emerge each spring to lay their eggs. Dragonflies spend most of their lives as nymphs living in the shallow water of marshes. 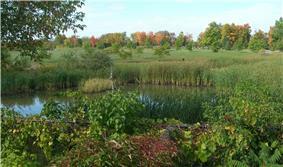 The Macoun marsh, Ontario, Canada, occurs within the city of Ottawa. ^ World Encyclopedia. "Marshes". Retrieved 4 February 2012. ^ a b c d e f Rafferty, J.P. (2011). Lakes and Wetlands. New York, N.Y.: Britannica Educational Publishing. ^ Campbell & Reece (2008). Biology Eighth Edition. San Francisco, CA: Pearson Education Inc. p. 1162. ^ Draper & Reed (2005). Our Environment. Nelson Education ltd. p. 96. ^ a b c d Keddy, P.A. 2010. Wetland Ecology: Principles and Conservation (2nd edition). Cambridge University Press, Cambridge, UK. 497 p.
^ B.R. Silliman, E.D. Grosholz, and M.D. Bertness (eds.) 2009. Human Impacts on Salt Marshes. A Global Perspective. University of California Press, Berkeley, CA. ^ Keddy, P.A. and A. A. Reznicek. 1986. Great Lakes vegetation dynamics: the role of fluctuating water levels and buried seeds. Journal of Great Lakes Research 12: 25-36. ^ Bauder, E. T. 1989. Drought stress and competition effects on the local distribution of Pogogyne abramsii. Ecology 70: 1083–9. ^ Calhoun, A.J.K. and P.G. deMaynadier. 2008. Science and the Conservation of Vernal Pools in Northeastern North America. CRC Press, Boca Raton, FL. ^ Richter, S. C. and Seigel, R. A. 2002. Annual variation in the population ecology of the endangered gopher frog, Rana sevosa Goin and Netting. Copeia, 2002, 962–72. ^ Smith, L. M. 2003. Playas of the Great Plains. Austin, TX: University of Texas Press. ^ United States Environmental Protection Agency. "Playa Lakes". Retrieved 5 February 2012. ^ Bolen, E. G., Smith, L. M., and Schramm, H. L., Jr. 1989. Playa lakes: prairie wetlands of the southern High Plains. BioScience 39: 615–23. ^ van der Valk, A. G. 1989. Northern Prairie Wetlands. Ames, IA: Iowa State University Press.